I seem to have developed an unhealthy obsession lately. I am unduly obsessed with the fall colors, or until recently, the lack of. After all, I live in Central Wisconsin, so it should be heartbreakingly beautiful in October, right? My last Focus Friday told the woes of driving even farther north than we live in hopes of discovering awe inspiring autumn colors. Nada. A few days after that drive, the colors miraculously appeared, even in our neck of the woods! Glory! I started out with a piece of Whisper White cardstock onto which I sponged my version of fall colors: a concoction of Cajun Craze, Always Artichoke, Crushed Curry, Cherry Cobbler, and, for a little mystery, Rich Razzleberry. Following the sponging, I turned to this retired set of gorgeous leaves. 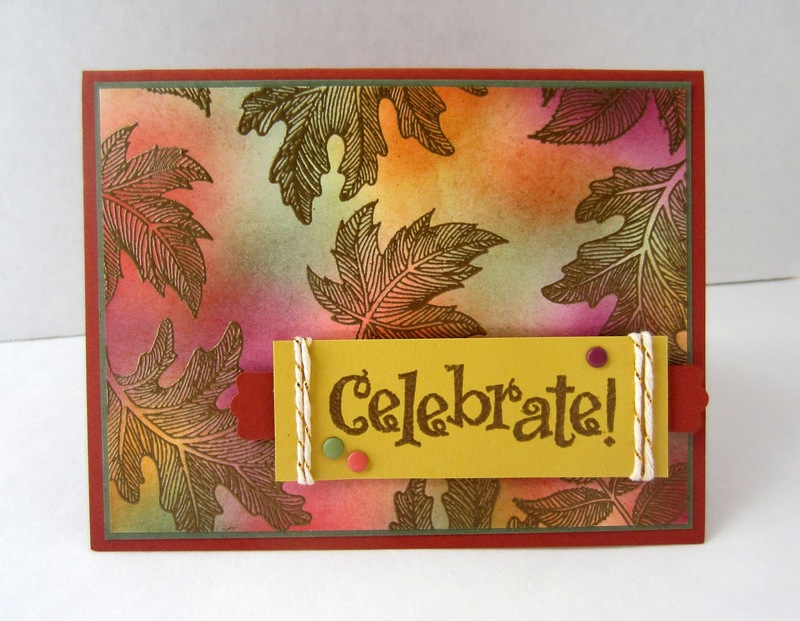 I love this set because of all the line work, which takes to heat embossing so beautifully. After stamping the leaves hither and yon in VersaMark ink, I covered the stamping with Gold Embossing Powder, and heated it to set the embossing. I did the same with the word, "celebrate". I wrapped some of the gold metallic baker's twine around the ends. It still seemed to need a little more pizzazz. 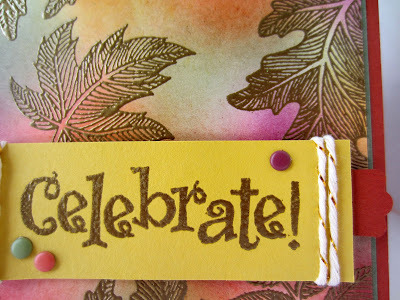 I considered adding some punched dots like I do so often in my cards. Then I remembered that I had recently gotten a package of the Candy Dots (page 161), which was still unopened. So I added three of the Candy Dots in coordinating colors to the sentiment portion. I love the look of these little pieces! Since I took these photos yesterday, I have removed the little ends of the Modern Label Punch in Cajun Craze from the sentiment piece. They just seemed -- I don't know -- STUPID?? It now has a cleaner look. Yesterday, we had lots of wind and rain, so many of the lovely trees took quite a hit. However, today, as I drove to work, I noticed that the trees in a large cemetery were still glorious. So, on my way home, I took advantage of the pleasant fall weather and the beautiful trees that somehow escaped the wind, and took lots of lovely photos. Ah. Now, my heart is happy. I love your card. All the colors and those leaves are so pretty. Pretty. I don't use embossing nearly enough when I make cards. Thanks for sharing with us at the #HomeMatterParty link party. I love this card, you are very creative. Thanks for linking up on My 2 Favorite Things on Thursday. Hope to see you again! Pinned!